Jurors in the federal death penalty trial of Boston Marathon bomber Dzhokhar Tsarnaev deliberated for a second day Wednesday after a judge tried to clear up some confusion about legal concepts at the heart of the case. Judge George O'Toole Jr. began the day by answering two questions the jury sent to him in writing late Tuesday. In its first question, the jury asked if a conspiracy pertains to a sequence of events or if it relates to a distinct event. Tsarnaev, 21, is charged with conspiring with his now-dead brother, Tamerlan, to bomb the 2013 marathon. Three people were killed and more than 260 were injured when twin pressure-cooker bombs exploded near the finish line. Three charges accuse him of conspiring with his brother to use a weapon of mass destruction, to bomb a place of public use and to maliciously destroy property by means of an explosive. Within those conspiracy counts, he is charged in the deaths of the three people killed in the bombing as well as an MIT police officer killed days later as the brothers tried to flee. The judge told jurors that the duration of a conspiracy is a question of fact they must determine. Prosecutors allege that the conspiracy between the Tsarnaev brothers began in February 2013 - two months before the marathon bombings - and continued through April 19, 2013, when Dzhokhar was captured. They say the conspiracy covered the bombings, Officer Sean Collier's death and a firefight the Tsarnaevs had with police in Watertown. Tamerlan was killed during the gunbattle. Jurors also asked if they had to decide whether the conspiracy resulted in all four killings and whether they had to be unanimous on each killing. The judge told jurors they had to make unanimous findings on all four. The jury also asked if there is a difference between "aiding" and "abetting." The judge said "aiding and abetting" is a single concept and means to intentionally help someone else commit a crime. 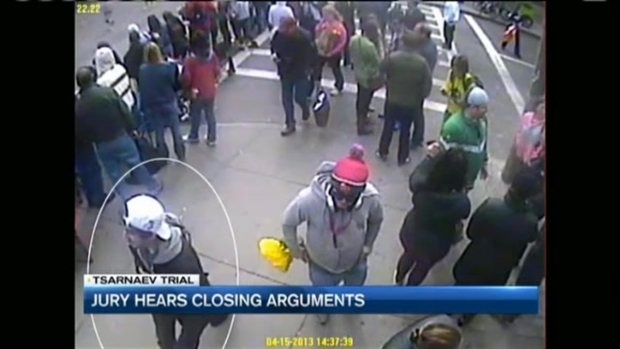 Tsarnaev's lawyers have admitted he participated in the attack but say Tamerlan, 26, was the mastermind. 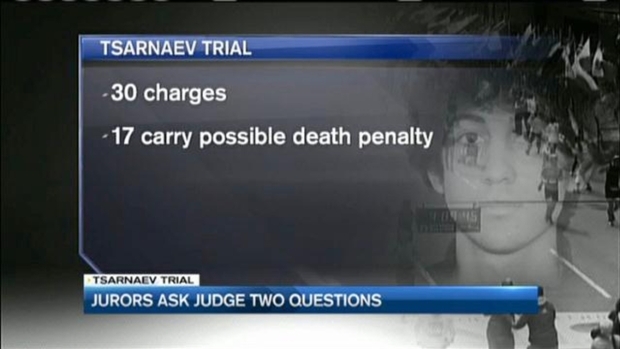 If Tsaranev is convicted, the same jury will hear evidence to decide whether he is sentenced to death or life in prison.